Recently, my husband and I were enjoying an afternoon together window shopping in Poulsbo. There are quite a few fun little shops there we like to peek in every once in awhile. We stopped in an antique store we hadn’t visited for a long time and on our way out, we discovered this great antique wood “bowl.” The shape of it reminds me a bit of a boat, but it is probably considered a dough bowl. 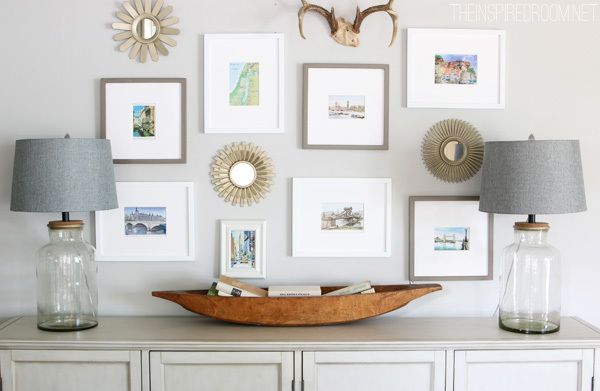 I had been keeping an eye out for something substantially sized and the right shape to sit on top of our console cabinets. The cabinets are long and not very deep, so I knew right away that this wood bowl would be perfect! I think it will be so fun for seasonal decorating, and even as a centerpiece on my dining room table filled with plants, fruit, shells, and just about anything else that strikes my fancy! This week I looked around to see what I had as my first attempt at using the bowl for display on the console. I saw a little stack of books I had found at a second hand store a few weeks earlier and decided to see if they would fit! Why not? Sure enough, the books fit! So for now the bowl is a charming little “tray” to corral books. Don’t you just love finding an old treasure and putting it to good use? 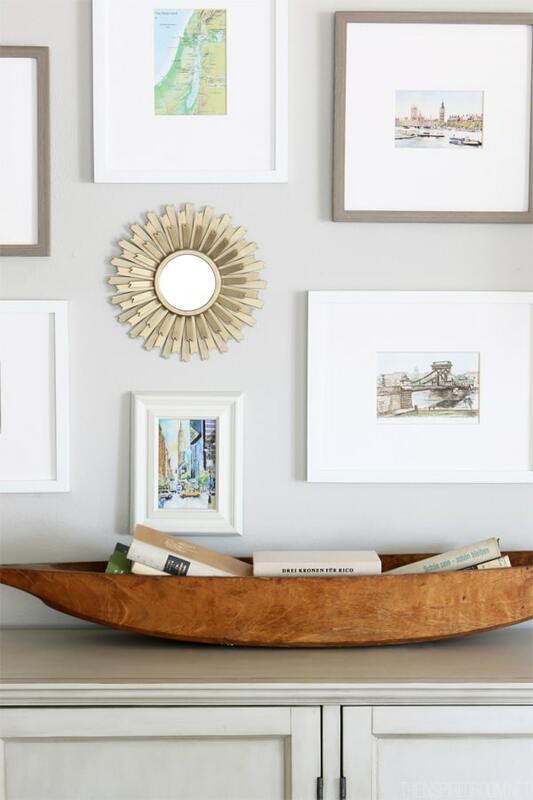 Affirmative on the finding unique things to repurpose in one’s home. Yesterday I bought a ginormous, old red mailbox at the antiques store in which I rent space. It’s resting on an old bench in our new yard, where it will store all my gardening supplies. I really am enjoying your posts….. simple, quick, attractive and inspiring! I also love how you find just the right item to complete a look and have fun in a great city along the way. It is important to have these times and be open to them happening in our stressed out world. Now you look at your bowl and remember the good time finding it. Not a waste of time at all as viewed by some!!! I love that, yes! That is what it is all about! Thank you Maggie! Old treasures are the best. Great find! Melissa, what a great find! It is the perfect shape and size, and I can see you changing it out with for the different seasons. What a find! Love it! And how fun it was just the right size for that spot and I can see it on a table easily. Your idea to put books in it? GENIUS! Love Poulsbo! When I work in Bremerton its one of my favorite places to walk. Also love Port Townsend for great shops. Great purchase! I have my grandmother’s (dad’s mom)and her wooden rolling pin that goes w/the bowl. My mom used it for years to make biscuits. My sister has my mom’s (her mom’s) and it includes a list of how it has been handed down from my great great grandmother. Looks absolutely lovely! I actually have a similar looking bowl that we just don’t know what to do with most of the time – we usually only pull it out for Thanksgiving. It’d be awesome to incorporate it into our living room. Melissa, how great would your soft, squishy pumpkins look in a huge wooden dough bowl? Nice find! Oh you are SO RIGHT! I can’t wait for FALL to try the PLUSH PUMPKINS in the bowl! Well, I do want summer first, but you know what I mean. Brilliant, thank you! Oh yes! definitely a brilliant idea :-) I love those plush pumpkins… there’s a shop on Etsy called the VelvetHarvest and she makes the most beautiful velvet plush pumpkins with real, natural pumpkin stems. Love, love, love! Lucky! Wish I had seen it first!! 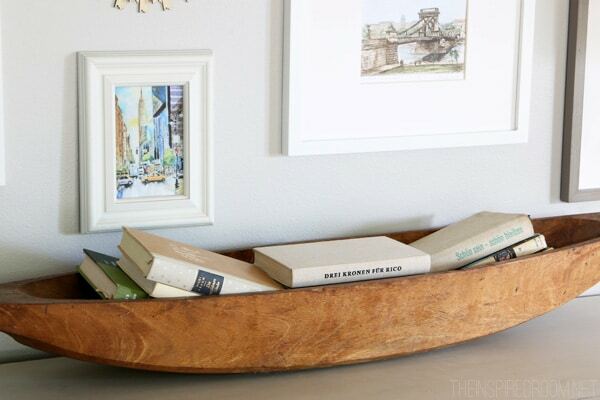 We love Poulsbo too, and think your boat shaped bowl is a great find. Enjoy it for all the uses you can think of for it through all the seasons! Love it. The other week I passed on a Georgian maids box, it’s still haunting me! Hi Melissa! I see you found the perfect spot for your dough bowl! I Love it! The picture display looks beautiful!! I really like the little mirrors and antlers you incorporated too. Your really good at what you do! Well thank you Maria! I just enjoy it and I’m glad you all enjoy visiting with me and hearing about my adventures in creating a home. Love it! I have been looking for something with similar shape and height for my dining room table, so as not to block guests view of each other. Nice find! Great idea for using it! I also have one that is from my husband’s family. It is wider but I never thought to use it to decorate. I have it on top of my kitchen cabinets. Time to use it!! Thanks for the ideas! Yay! I’m glad it inspired you. Have fun with yours! I love the shops in Poulsbo , great find, and thank you for all of the inspiration! I love this bowl. It is actually very difficult to find vases and bowls that are long and narrow in design, and yet so many of us have tables and consoles which would benefit from this shape. I’d like to find something similar to make an arrangement for my dining room table. Love the bowl, Melissa! What a fun find! Your new bowl is a wonderful addition to your console cabinets. And the wood is the perfect accent to the other tones. Great find!! It’s wonderful that Jerry enjoys perusing the shops along with you. I noticed on the wall, one of the frames is holding a map of the Holy Land. Because I know you decorate with meaning… were you blessed to take a trip there, Melissa? I never thought about going, but several years ago I had an opportunity to go with my husband for about a month on an archaeological dig and did some touring on the weekends, too. It was a great experience.